most of the time when december rolls around, i often hear the “here we go again” phrase accompanied by a long sigh. the holiday season can be stressful – there are so many events such as kids’ christmas concerts, work parties, get-togethers with family and friends, not to mention all the other things we need to remember such as buying and wrapping presents not only for our families but also for teachers, neighbors, co-workers, and the crossing guard. oh! and don’t forget that it all has to be done within a budget! we need to plan for and make special holiday dinners and other food, send out christmas cards, and all on top of our normal, already busy, everyday to-dos. no wonder it can be stressful! 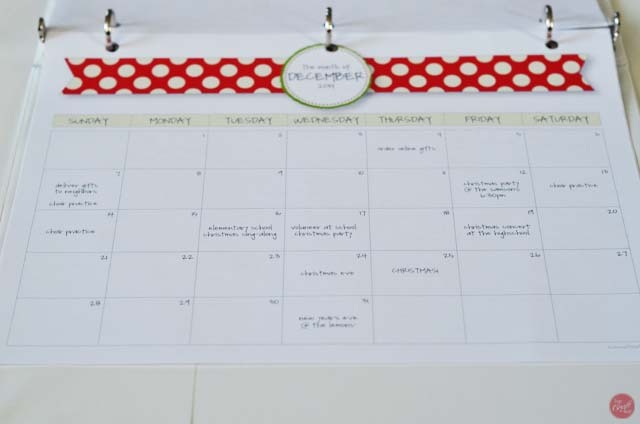 fortunately for me, i’m a list-maker and i love to plan things out in advance. i feel like if i have a plan then i can either chip away at it as i’m able without going off course, or just get it all done and out of the way at once. i start making a list of things i think my kids would like getting for christmas way back in the summer. 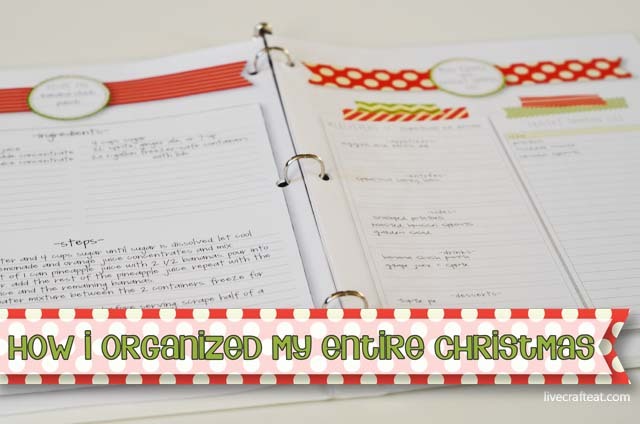 admittedly, i usually lose the list several times between the summer and christmas and have to start over and over again, but this year i was determined to have one plan and to stick to it. so i made myself a christmas binder to hold everything christmas-related – including my kids’ christmas list. if i don’t have a place where i can write down every expenditure for the month of december i can easily get carried away and spend way more than i ever intended! in this list, i made a space for budget categories and their amounts. for example, some of my budget categories for this season include: christmas gifts, groceries, decorations, holiday traditions, neighbor gifts, etc. i need to know what i need to spend money on before i can create my budget. i give each category a certain amount of money. then when i spend anything at the store, i write down the budget category and the amount spent so i can glance through the budget tracker and see where i am in each category. so far this has helped me a ton in being accountable for the money i spend! because these are the busiest months of the year, i make a special place for them in my planner/organizer. 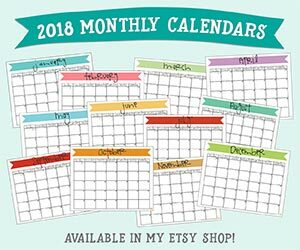 and there’s no specific year attached to them, so i can print a new calendar each year, fill in the dates and jot in all the events and goings on that we have. while the monthly calendars are great for writing in events and parties and other things that we need to go to, i still needed a place to write in all the nitty gritty details of what needs to happen on any given day. this daily to do list gives me a place where i can write it all in and see the entire week at a glance. one of my favorite parts of christmas is planning what gifts i’m going to get for everyone on my list. 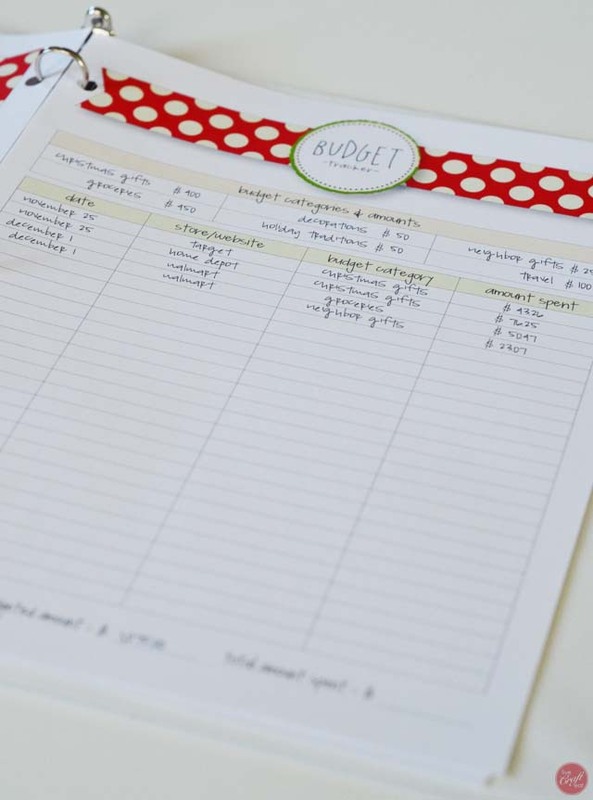 this also helps me to keep a budget because i can see how much money i have or plan on spending on each person. it also helps to plan in advance because if you know what you’re looking for you can watch for good deals on each item. i love having everything purchased before the month of december. seeing all those check marks just make me happy! 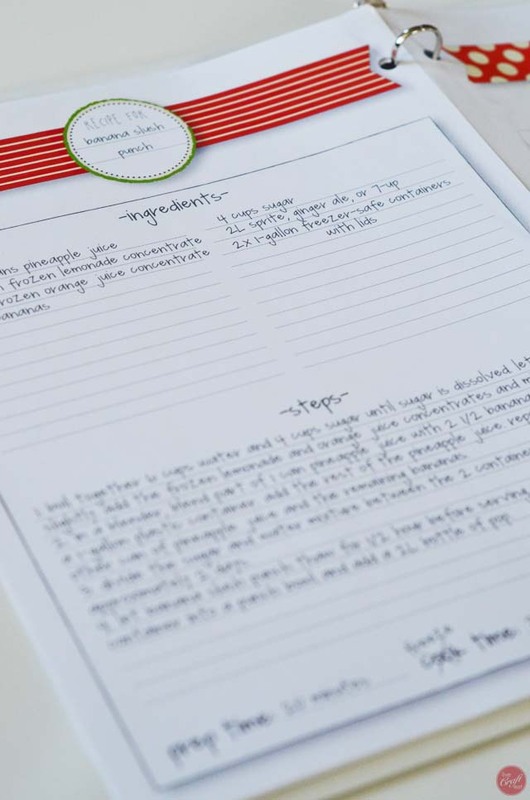 since i already have my own everyday menu planner, i made this meal planner just for the “big” dinners that happen during the holidays. in my family we have our christmas dinner on christmas eve and then a huge brunch on christmas day. 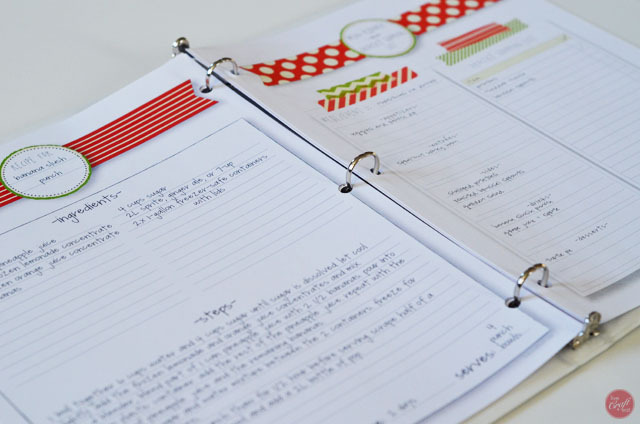 these holiday menu planners are perfect for planning out those big, out-of-the-ordinary meals we have. and right next to the menu planner is a shopping list so i know what i already have and what i still need to buy for those meals. nobody wants to be left without banana slush punch on christmas eve! so i plan everything out ahead of time and purchase the non-perishable items or items i can buy, freeze, or prepare in advance throughout the month so they’re ready to go. every christmas/holiday season we seem to make a lot of the same things: banana slush punch, mini cheesecakes, homemade cinnamon rolls, and hashbrown and ham breakfast quiche, just to name a few. it’s nice to have these special recipes in page protectors in my christmas binder so i know exactly where they are and can easily flip to them when i need them. 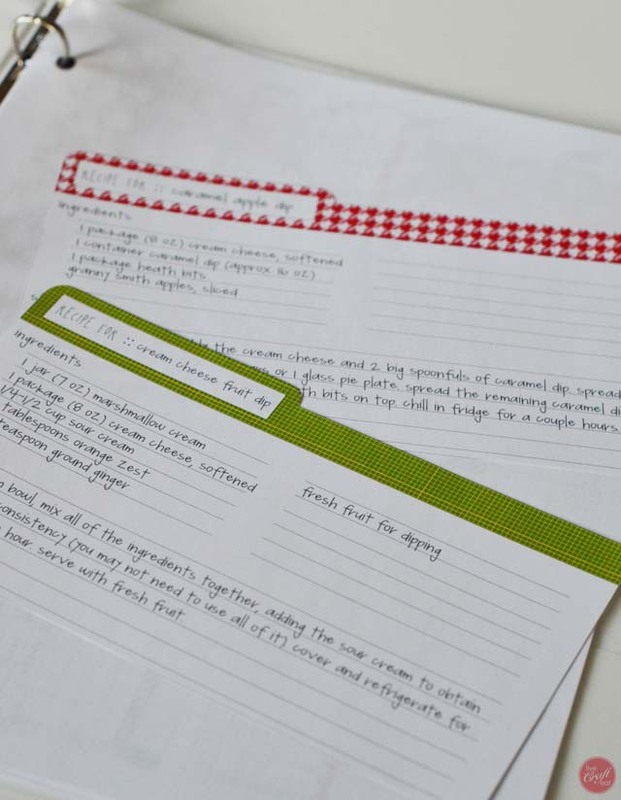 these recipe cards are great for those short little recipes like cream cheese fruit dip, or caramel apple dip – you know, the ones that are really short and uncomplicated but you love them so much you keep the recipe ready at your fingertips to make at a moment’s notice? i like to write on these, print them out, cut them and then laminate them to keep in one of the inside pockets of my christmas binder. easily accessible! because you know every year you end up emailing or calling people asking for their mailing address…. i’m keeping family and friends’ addresses all in here so when it comes time to address all those envelopes, i a) don’t accidentally forget to send one to someone, and b) i can just address the envelope and be done instead of trying to track them all down. just one of those things that can help make the holidays less stressful! 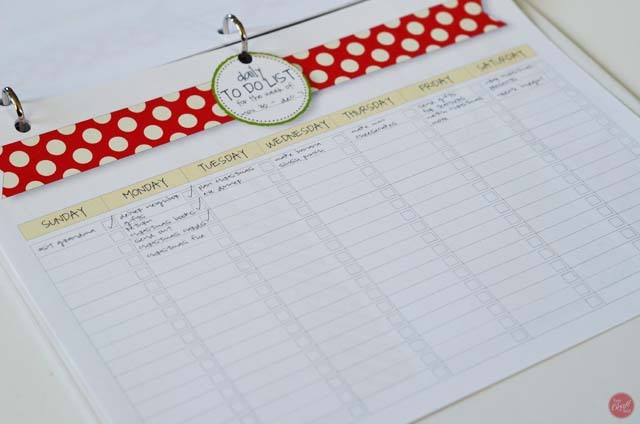 *leave a few pages or page protectors in the back of your binder for any extra notes, or for christmas pictures and tutorials you find inspirational from magazines or pinterest, etc. 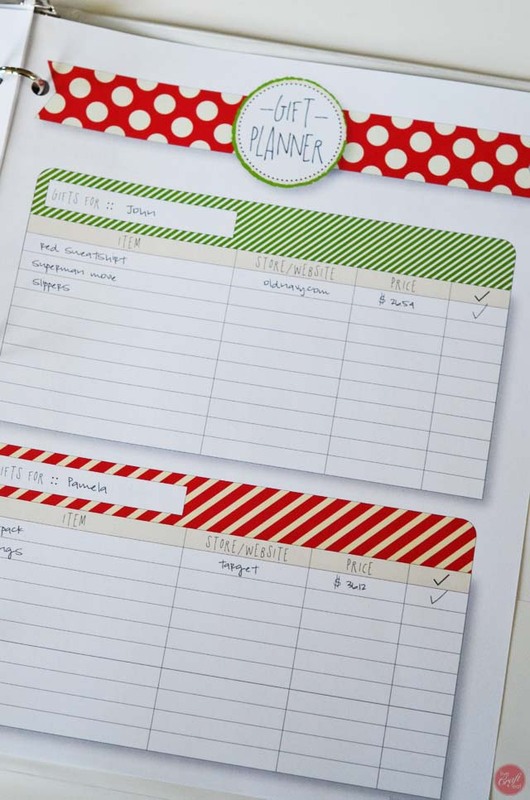 this binder is a great place to keep all your lists, and all things christmas. here’s to a fabulous (and stress-free!) holiday season to us all!! 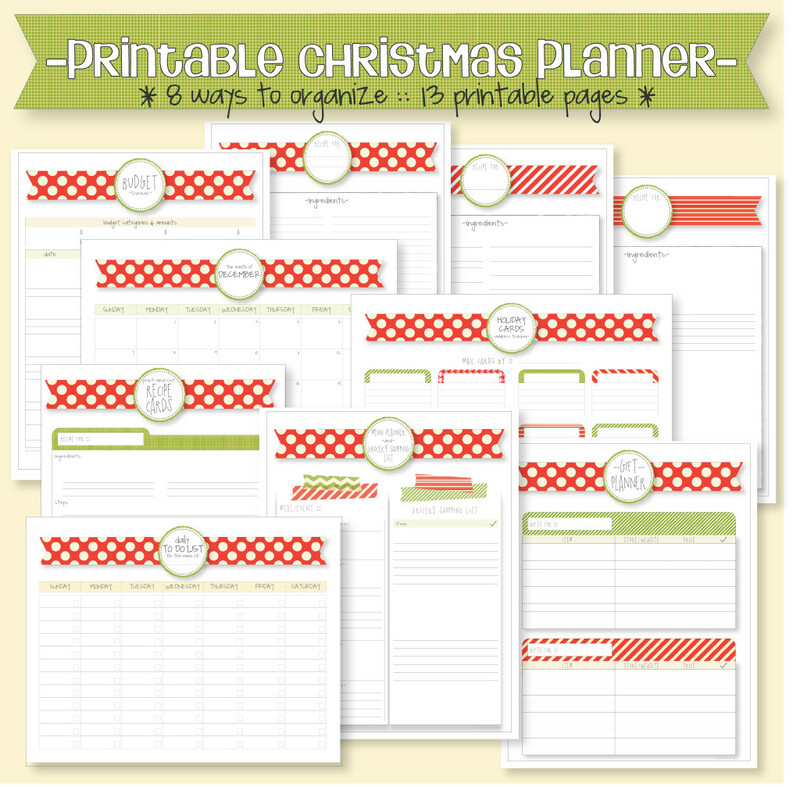 if you’d like to use my printables for organizing your own holiday happenings, all the ones described or listed in this post are available in my etsy shop under “printable holiday/christmas planner” – it comes as an entire bundle that you can use year after year to make your holidays as stress-free as possible! laminate them or put them in page protectors to keep reusing them, or print out new lists every year – it’s up to you! click this image or the link above to see the listing! I did NOT use any type of Christmas planner this year. I’ve learned my lesson! Thanks for sharing this. Hi Katie! 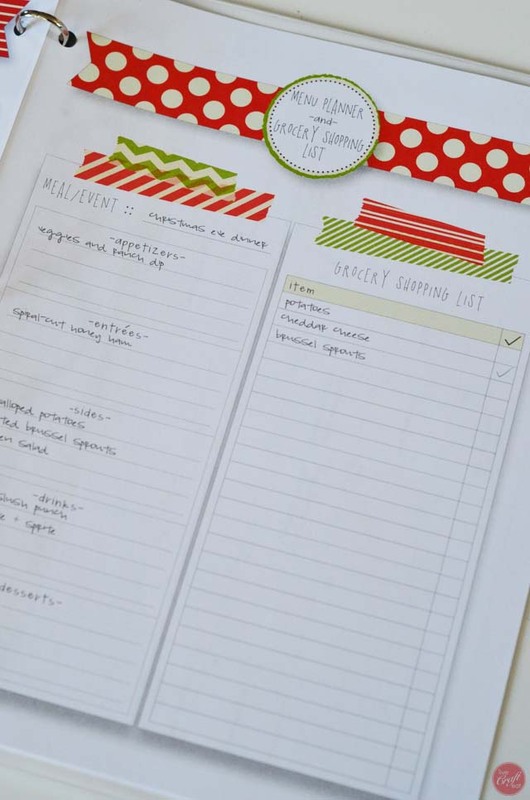 Love this post and shall be purchasing these list templates first thing tomorrow. 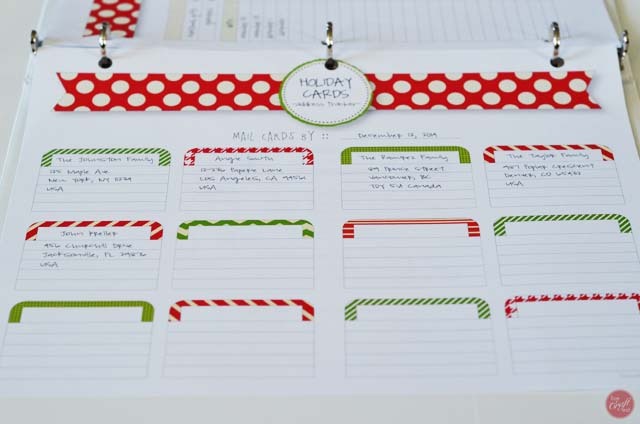 I have recently written a blog about starting Christmas preparations in September and I have recommended in my post that my readers head over to here and check out your templates! Thanks.